Vegetarian Adaptation: None needed! This one’s all veggie. 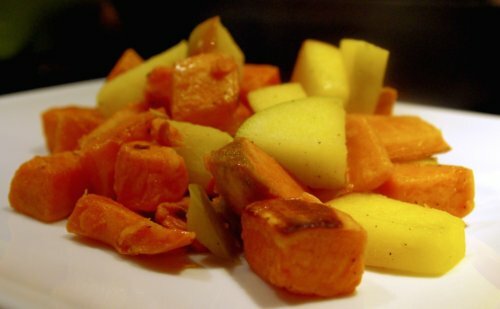 Position your oven rack in the top third of the oven and preheat to 475 degrees F.
In a large bowl, toss together the cut sweet potatoes, coconut oil, and liberal salt & pepper. Pour coated potatoes onto a rimmed baking sheet and use a spatula (or your hands!) to evenly distribute them into one layer. Place in oven and roast for 10 minutes. Remove and use a spatula to “unstick” and flip potatoes, and then roast for 5-7 more minutes until tender and slightly browned on the edges. While your potatoes are cooking, heat the grass-fed butter over med-high heat in a large, non-stick skillet until melted and just beginning to brown. 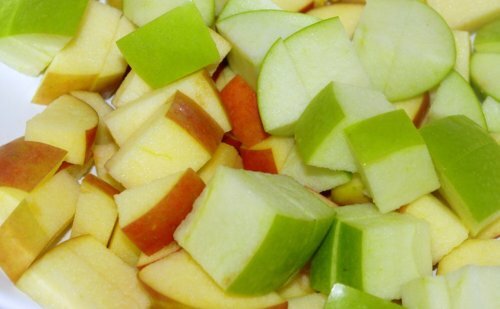 Add cubed apples and cook for 4-6 minutes, flipping occasionally to ensure even cooking. 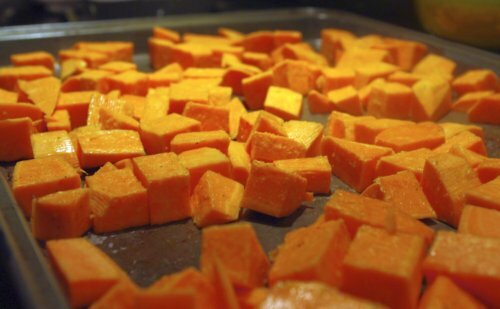 Once they’ve softened up and absorbed some of the delicious butter, they’re all done – place ’em in the large bowl you used for the sweet potatoes. Once the potatoes are cooked, just add them to the apples. Combine gently with a spatula and test your seasonings. We found that another liberal dose of salt and pepper made this dish just right. Transfer to serving bowl and enjoy! 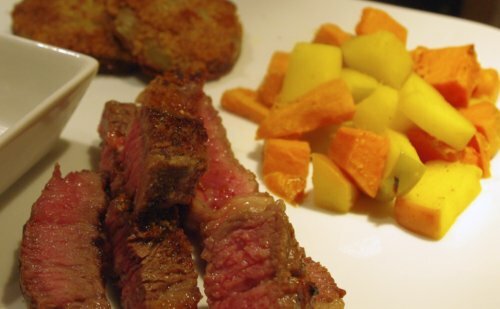 I paired this with a cast-iron ribeye steak, Paleo fried green tomatoes (recipe coming soon! ), and a glass of wine. Yum! So I was wondering…where does the lemon juice go? I read it in the ingredients, but there’s no mention of it in the recipe instructions. Thanks! Great question! 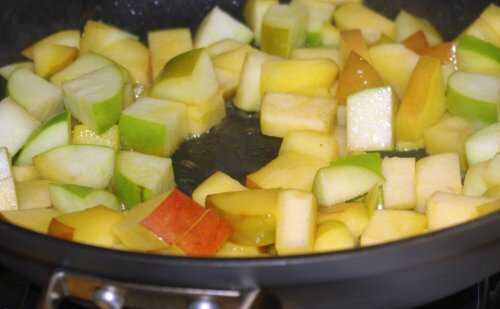 You totally found a typo on my part… 🙂 You just toss the lemon juice with your cubed apples to avoid browning while you’re putting together all your other components. Not a super-necessary ingredient, but can be good if you’re a mise en place-sort-of person. I’ve updated the recipe – thanks for catching that!